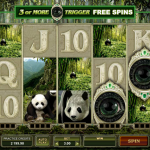 Untamed Giant Panda is another addition to the “Untamed” series from Microgaming. So let’s all board the plane and go to China to visit the giant panda and solve whatever the reason for their extinction is. At first look we can see that this is one heck of a game, with superb graphics and sound effects. Despite the fact that the game offers some out of the ordinary gaming experience it is still very easy to play. Untamed Giant Panda is packed with special features. First we have the game`s logo wild which has double function. It substitutes for every other symbol except for the scatter to complete a winning line and it also activates the Collect a Wild bonus. This feature is not seen very often. Namely, below every reel there are 4 empty boxes and every time you land a wild on a given reel one of the boxes will fill up. After you have collected 4 wilds the entire reel will turn wild and you will receive 4 free spins. The ideal situation here would be to turn as many reels as possible entirely wild at the same time. The Panda Eye is the scatter symbol and it activates the free spins. 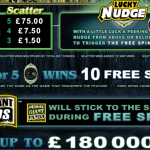 You get 10 free spins and every time you land a wild, it will freeze and remain that way until the feature lasts. 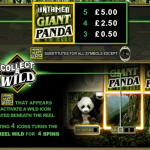 Untamed Giant Panda is a huge success and we have to thank Microgaming for coming up with a game like this. This is truly one very entertaining game with special features that are put there just so you can win as much as possible. The anticipation of turning all the reels wild will keep you at the edge of your chair during the whole game play. Egypt is always a quite popular theme and Throne Of Egypt a 5 reel slot by MicroGaming, is another example why people keep playing them.